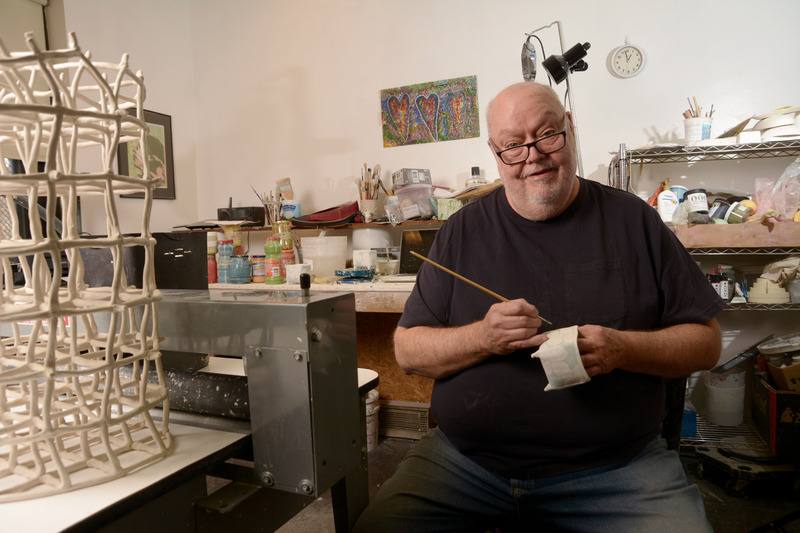 Jerry Bennett in his studio, Philadelphia, Pennsylvania, 2018. Artists’ use of paper clay is relatively new in the history of ceramics. I attended the first international paper clay symposium in 2002 at the International Ceramic Studio in Kecskemét, Hungary, and then as co-leader of the second symposium ten years later. One of my major impressions from both symposia is how different artists’ interests in and use of paper clay are. Since there is such diversity in the use of paper clay, it leads to confusion for artists new to the material. One possible source of confusion is that when we use the term “paper clay,” we are really talking about a material composed of cellulose-based fibers, not just paper fibers. The cellulose-based fibers commonly found in paper clay are paper, cotton, linen or flax (from which linen cloth is made), and kenaf, also known as jute. Protein fibers, such as wool, and manufactured fibers, such as nylon or fiberglass, don’t work as well as cellulose fibers because their structure is not complex enough. They lack the hollow tube structure of cellulose fibers or, in the case of protein-based fibers, they decay very rapidly. Cellulose fibers allow for a capillary action when used in the clay body, improving the workability of the clay. In reality, we should be referring to this material as fiber clay, not paper clay, to help artists understand this material. Speaking of materials, one of the most common questions I get asked during my workshops is about whether it’s a good idea to use dryer lint in clay. You want a source of fibers in your clay that is consistent and that you can obtain in enough quantity to meet your needs; dryer lint doesn’t meet either criterion. Another question I get is about using toilet paper as a source of fibers. Because toilet paper has additives to make it soft, fiber clay using toilet paper lasts only a week before it begins to break down. If you want to use toilet paper, look for toilet paper without additives, usually a very low-quality kind. Toilet papers made of recycled materials might be acceptable because they are less likely to have organic additives. I advise people to use newspapers to begin their work with fiber clay, first breaking the newsprint down in water to make a pulp. Use only newsprint for your fiber source, not the shiny-surfaced advertising sections. Paper clay artists use different fibers, and combination of fibers, based on the type of work they are making. I use a fifty-fifty mix of paper and second-cut cotton linters in porcelain to make my fiber clay. I add ninety grams (three ounces) of fibers to a twenty-five pound bag of plastic porcelain. Note that the weight of fibers is based on a dry weight. Remember that how much fiber you put into clay depends on the type of clay and what you are making. If you are pushing the capacity of a clay such as thin porcelain, or working with complex sculptural forms, try increasing the amount of fibers or combining fibers in this order: paper cotton, kenaf, and flax. Experiment with ratios and different fibers! 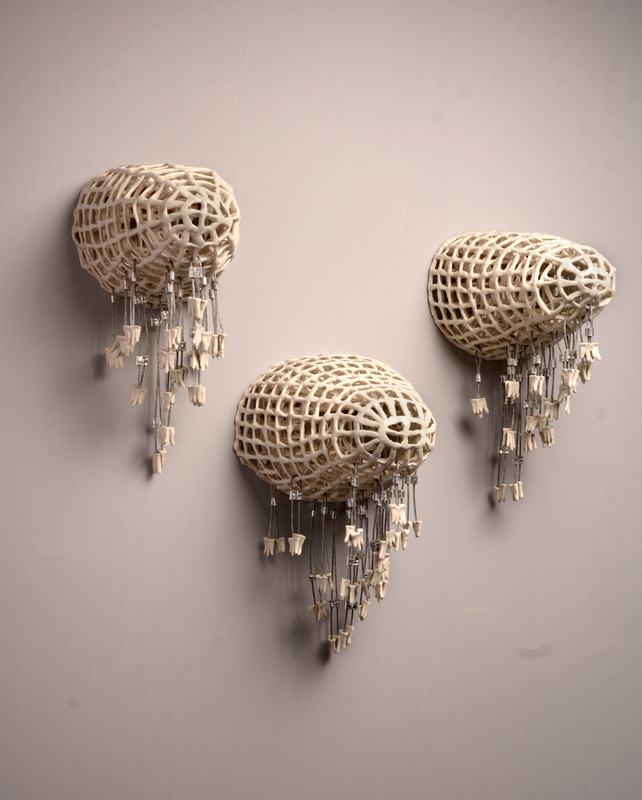 For sculptural applications, you can easily double the quantity of fibers. A mix of newspaper fibers and cotton afforded me the best balance, providing a faster way of working. Other fibers, such as kenaf, may be very rough, unless they are reduced to a very short fiber, such as that used in papermaking. The best way to incorporate these into the clay is to purchase fibers processed for papermaking. You can buy them as sheets of paper, then break them down and incorporate them into your clay. Many of the commercial fiber clays available use kenaf as part of their fiber mix. Use kenaf fibers for sculptural work, rapid-fired work, or raku. Abaca, also known as Manila hemp, is another fiber used for papermaking and is a good material for mixing with clay. Abaca fibers are harvested from the bark and stem of the plant. Abaca affords a good mix of fibers, both short and long, making it an excellent addition to clay. When I use abaca, I use about one hundred grams of fibers to twenty-five pounds of plastic clay and reserve it for sculptural work. The slabs I work with are tougher, more like wet leather than a slab of traditional porcelain. Porcelain has a uniform particle size, making it inherently weak and difficult to mold, and the porcelain I use is like working with toothpaste until I add the fibers. Much larger than the particles of the porcelain, the fibers act like rebar in concrete. Cotton added to the fiber mix increases the dry, greenware strength. When I make larger forms that are difficult to move into a kiln, I increase the amount of cotton fibers in my clay. Artists in Europe have developed one of the most interesting fiber clays: casting slip with fibers, which they use to cast very thin, translucent slabs. They start with deflocculated clay slip, add fibers, and then dry it to the point of a plastic clay for use. Often their fiber of choice is flax. Flax creates a very strong clay body and makes building very large sculptural forms possible. Some of the artists using flax make sculptural work that goes unfired. Over time, the clay surface darkens and remains very hard. Sources of fibers for your work can be as simple or complex as you want. The simplest source is newspaper or fibers from papermaking supply houses, such as Carriage House Paper (carriagehousepaper.com) and, in Canada, Twin Rocker Handmade Paper (twinrockerhandmadepaper.com). You could also ask printmakers or other artists using paper fibers for their sources. Experiment with fibers, sticking to supplies that are consistent—ones that will yield the same results time after time. Jerry Bennett earned his MFA from Indiana University at Bloomington in 1975. In 2005, he was an honored guest at the first International Paper Clay Symposium in Kecskemet, Hungary; and in 2012, he was the leader of the second Paper Clay Symposium. He lives in Philadelphia, where he teaches and runs Two Rivers Studio.